Drew Brees needed less than a half to take care of the NFL career passing yardage record and less than three quarters to take care of the Washington Redskins. Brees threw a 62-yard touchdown pass to rookie Tre-Quan Smith to surpass Peyton Manning's record 71,940 yards in the second quarter as the New Orleans Saints built a 26-13 halftime lead. He led two third-quarter touchdown drives as the Saints rolled to their fourth consecutive victory after a season-opening loss, 43-19, on Monday night in the Mercedes-Benz Superdome. The Saints enter their bye week before visiting Baltimore on Oct. 21. The Redskins are 3-2. Brees completed 26 of 29 for 363 yards and three touchdowns and had his fifth consecutive interception-free game. Smith, a third-round draft choice who caught one pass in the first four games, finished with three catches for 111 yards and his first two NFL touchdowns. Mark Ingram II, returning from a four-game suspension, scored two touchdowns as he rushed for 53 yards on 16 carries. The defense forced two turnovers, limited the Redskins to 4-of-13 on third downs and held them to 283 yards, including just 39 rushing. "We accomplished a lot of the team goals going into this game that were necessary to win," Saints coach Sean Payton said. "Us being able to win on a night when a significant record was broken makes it that much more special." The record-breaking pass came shortly before the two-minute warning in the second quarter and gave New Orleans a 26-6 lead. The fact that the score created a natural stoppage in play allowed the NFL to acknowledge the record on the spot. Brees' teammates swarmed him on the field and the ball was handed to David Baker, President of the Pro Football Hall of Fame, for him to transport to Canton, Ohio. Brees acknowledged a rousing ovation from the crowd on his way to the sideline to hug his wife and then Payton. Shortly thereafter a brief video of Manning, a New Orleans native whose father, Archie was the most productive quarterback in Saints history until Brees came along, offering a characteristic humorous, yet sincere congratulations to Brees played on the video screens. Moments later, the celebration was dampened a bit as Alex Smith ran 4 yards for a touchdown that pulled the Redskins within 26-13 at halftime. 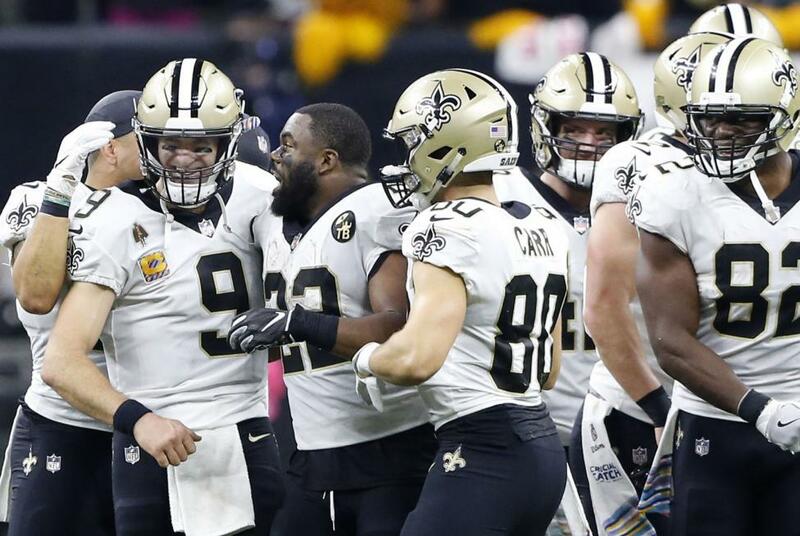 But the first possession of the third quarter ended with Brees throwing a 35-yard touchdown to Smith, and the Saints' next possession ended with Taysom Hill running for a 1-yard touchdown. That restored the celebratory mood as New Orleans took a 40-13 lead into the fourth quarter. Wil Lutz added a 44-yard field goal for the Saints and Washington's Kapri Bibbs ran 1 yard for a touchdown to complete the scoring. "We got behind early," Redskins coach Jay Gruden said. "We have not been a very good team when we get behind, for whatever reason. We weren't able to make any plays to get ourselves back in the game. "We had three penalties on defense on third down that kept drives alive. When we give Drew Brees extra snaps, he is going to make you pay. Offensively we didn't protect very well. We didn't have open receivers. We didn't call very good plays. It was just a total team debauchery." The Saints won the coin toss and Payton resisted the temptation to put the ball in Brees' hands right away and deferred the option until the second half. New Orleans forced a three-and-out to start the game and Brees completed passes of 20 yards to Michael Thomas and 28 to Ingram on the way to Ingram's 2-yard touchdown run. After a Redskins field goal, Brees drove the Saints 75 yards and tossed a 1-yard touchdown pass to Josh Hill. After another Washington field goal, the Saints marched 75 yards to Ingram's 1-yard touchdown run. Along the way Brees had completions of 14, six and 46 yards to climb within 35 yards of breaking the record. "I just tried to stay very focused on the game and executing each play one at a time, knowing that you're slowly creeping closer and closer," Brees said. " After a Washington punt Brees started at his 38 with more than two minutes remaining in the half. On the first snap he found Smith all alone up the East sideline and hit him in stride for the touchdown and the record. "I thank God it was me," Smith said. Brees said the record came on a new play. "It was just this idea that you flood the zone and maybe someone pops open and that's basically what happened on that play," he said. "There were a lot of guys out there. We were just running guys all over the place and I think it might have gotten them a little confused and Tre'Quan popped right open." There was still plenty of football to be played, but the significance of the game had already been determined.